The Collections Tab (l icon) is the second to last tab on the right of The Sidebar. This tab stores Macros, Card Decks, and Rollable Tables; which can come in handy for automating parts of your game or simulating particular component you'd find in a board game. Macros are user-defined shortcuts to commands you regularly want to repeat, such as combining a character emote, an attack roll, and a damage roll to activate all at once and be player/character sensitive. Requiring a large amount of documentation in its own right, we have a dedicated wiki page specifically for just Macros. Card Decks in Roll20 are collections (e.g., a deck) of one or more card objects that can be shuffled, drawn, dealt to players, traded between players, and can be played directly to the Tabletop. Every Game created gets a deck of standard 54 playing cards (includes Joker cards) by default in the Collections tab, but you can create your own as well. By default, a deck is hidden. If you want to interact with a deck, click the Show button to the right of the deck name. The deck will appear along the right-hand side of the Tabletop area. You can reveal as many Card Decks as you need. If you reveal more decks than there is vertical space to fit them all on the Tabletop, a scrollbar will appear to allow you to access all your decks. Depending on a Card Deck's Settings, a revealed deck may be visible to everyone in the game or only to the GM. To hide a deck again, click on the Hide button that appears to the right of the Card Deck name OR click on the Hide option in the Deck Menu. This option is for dealing multiple cards to your players. A dialog box appears that first asks how many cards to deal. Below this is a field called Select Some Options. Clicking on this field brings up a drop-down menu which specifies who is to be dealt the inputted number of cards in the previous field. The first option listed is "All Players" and afterward lists the name of every single current player that has logged into your game. Lastly is a button labeled Deal Cards to Turn Order Items, which is explained fully further below. This option allows you to return cards back to the Deck. A dialog box opens up that tracks how many cards are currently held in the players' Hands, placed on the Tabletop, and those still left in the Deck ("Unplayed"). Lastly, there is the total number of cards in the Deck. If there are cards in players' Hands or on the Tabletop, a Recall button will appear to the right of its entry. Clicking this button will return that group of cards back to the deck. At the top of the dialog box is a checkbox that will automatically shuffle the deck when you click on any Recall button if it is checked. Lastly, at the end of the dialog box is a blue button labeled Recall All that will recall everything from the players' Hands and on the Tabletop at once. Clicking on the Shuffle option will bring up a confirmation dialog to confirm the action. Once accepted, the deck is shuffled. If there is a Discard Pile enabled for the Card Deck, the cards will be added back to the deck first and then shuffled. Much like clicking on the Hide button on the Collections Tab itself, the Hide option will hide the current Card Deck. You'll need to reveal it again by clicking the Show button once more from the Collections Tab. If enabled from the Deck's Settings, the Discard option will reveal after the Hide option. Clicking on the Discard option will open up a dialog box that reveals all the cards currently within the Discard Pile. Mouseover the deck to interact with it. The most basic action is to draw the next card from the deck, which you can do by just clicking toward the top of the deck, where the next card is "peeking out" from behind the deck. The card will be drawn and shown on top of the deck, and anyone (including players) who has permission to see the deck will also see what card was just drawn. If you want to play a card from the deck to the Tabletop, you can click and drag on the card you just drew (the top card on the deck, that's facing up) and drop it onto the Tabletop. It will appear as a token on the Tabletop that you can move and resize just like a regular token. You can also drag and drop the next card (the one you would normally click on to draw the card) directly from behind the deck onto the Tabletop, and this will play the card to the table without first revealing what the card is. Holding the Shift key while you drag the card onto the Tabletop will play it face down instead of face up (which is the default). You can also right-click on an already-played card to flip it over and switch between face up or face down. You can also deal cards to players. This allows players to have a collection of cards in their "hand" just like at a real tabletop. To do so, just drag a card from the back of the deck (like you would if you were playing it to the Tabletop or drawing it) or the top of the deck (if the card has already been drawn), and drop the card onto the name of the player along the bottom-left side of the tabletop area. You will see a little icon of the deck appear above the player's avatar along with a number representing how many cards that player has in their hand. If you want to deal multiple cards at once, you can choose "Deal" from the deck menu that appears when you mouseover the deck. This will let you deal many cards to each player (or specific players) at once. Players can also pick up cards that have been played onto the Tabletop as tokens by right-clicking on the card and choosing "Take Card." 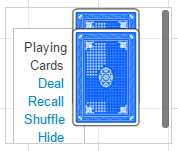 If you want to take back the cards that you've dealt and played, you can click on the "Recall" button in the deck menu that appears when you mouseover the deck. You have the ability to recall cards from the tabletop, from player's hands, or just those that were discarded (drawn but never played or dealt). You can also shuffle the deck as your Recall it, which puts all the available cards back in a random order. There's also a separate Shuffle option if you just want to Shuffle the discarded cards without taking back any played or dealt cards (this will shuffle all cards which are in the "discard pile" of the deck, which includes all cards which have been deleted from the table or which were never played/dealt after being drawn). Some games, such as Savage Worlds, utilize a playing deck to manage an initiative order. 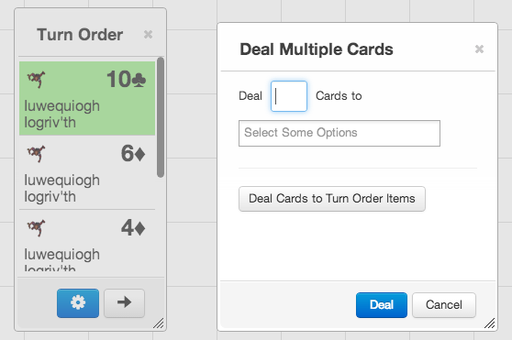 A secondary option available from the Deal window is a button labeled Deal Cards to Turn Order Items. If you have tokens/characters added to the Turn Order Tracker, pressing this button will deal a card to each entry in the Tracker. You can also drag a single card to the Turn Order Tracker by first turning the top card on the Deck over and then clicking and dragging it to a character in the turn order. Note: You should aim your mouse cursor for the entry field that lists the turn order number. It will highlight in yellow if you're hovering in the right place. Otherwise, Roll20 assumes you're dropping the card to the Tabletop instead. After the players have been dealt cards and have one or more hands, they can click on the card icon above their avatar to open the hand. They can view the cards in their hand, as well as drag and drop to re-order their hand. They can also use the button at the top-right of their hand while it is open to view all the cards together or view the cards in their hand organized by deck. If they drag a card from their hand onto the Tabletop, it will play the card onto the table, removing it from their hand. Players can also open each other's hands, and by default they will only see the back of the other player's cards. If they mouseover a card in another player's hand, they have the option to "steal" that card. A dialog box will popup for the player they are stealing from to let them confirm the action. This is useful in games where players can steal from each other's hands, without seeing the card first. If a player drags a card out of their hand and onto another player's name, it will initiate a trade between the two players. The players will both see a dialog box which lets them add and remove cards from the trade, and when both have confirmed the trade is acceptable it will proceed. Show deck to players? If checked, players will see the deck and any cards drawn onto the top of the deck. If unchecked, only the GM will see the deck. Players can draw cards? Determines whether players or only the GM can draw cards from the deck. Cards in deck are infinite? If checked, the cards from the deck will never run out. Otherwise, once all cards have been drawn from the deck you'll need to recall and shuffle to keep drawing (just like a real physical deck). Note: If you see an error "Ran out of cards in deck before dealing cards to all players!" try shuffling the deck. In other's hands These options determine the visiblity of cards that are dealt to player hands. Number of cards means that the GM/player will see the number of cards in the player's hand. Front of cards means the GM/player can also see what the card is, instead of just the back of the card. By default the GM and players both see only the number of cards in players hands, but not what they are. Discard pile The discard pile collects all cards which have been played and then removed from the Tabletop (by deleting them), and all cards which are drawn but never played onto the Tabletop or into a player's hand, are automatically added to the discard pile. These options allow you to determine how players may draw from the discard pile (by drawing only the single top/bottom card, or by choosing a card from the entire pile either by the back or face of the card). Cards played on Tabletop are played Determines if cards played from the deck and player's hands are played to the Tabletop face up or face down by default. Holding the Shift key while playing a card will do the opposite of the default (e.g., play the card face-up if the default set here is face-down). Card size on Tabletop Determines at what size the cards are played to the Tabletop. If left blank, the system will automatically determine a size. Underneath the deck's options, you will see a listing of each card in the deck. Click the "Add" button to add a new card, or click on the name of an existing card to edit it. Doing so will bring up a dialog box with additional settings for that card, which allow you to set the card's name and upload an image for the card, as well as a button to delete the card. Note: If you are uploading images from your User Library, you will need to search for them in the Art Library tab and drag them onto the Card Image Area. Below the listing of cards you will also see a place to upload an image to serve as the "back face" of all the cards for this deck. Important Note: Your card faces and card back should all have the same dimensions for best results! A rollable table is a collection of items from which a single item will be randomly chosen. It can be used to create custom dice, critical success/failure tables, loot tables, or any other list of items that need to be "rolled." 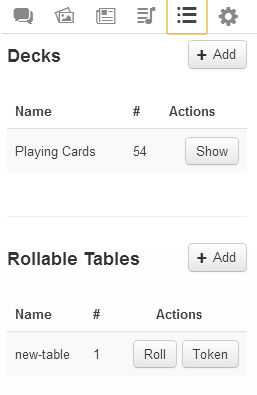 Rollable tables are found under the right-hand Sidebar, under the "Collection" tab. 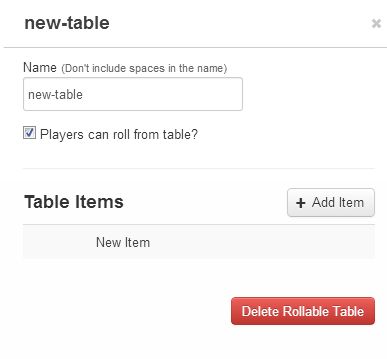 To start a table, click "Add" and the interface will show you have a "new-table" with "0" items. Click on the name of the table, which again by default was "new-table". This will launch a pop-up screen, from which you can change the name of the table, toggle whether or not players can use this table, and add "items" to your table. To add an item, click "Add Item," which will launch an additional pop-up screen. Similar to the last you can then name this item. By default, the name you enter will be shown in the chat box if this item is selected when the table is rolled. If you are creating custom dice which have numeric values, enter a number into the name field. Otherwise you can enter any text you want. 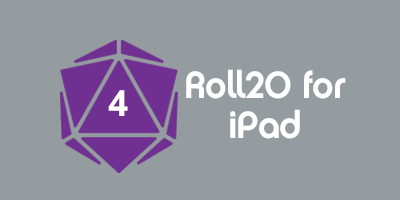 If your rollable table has icons representing each item, or you are creating custom dice which have graphical sides, you can drag and drop an image into the Icon area. The icon you upload will be shown in the chat box if the item is selected during a roll. 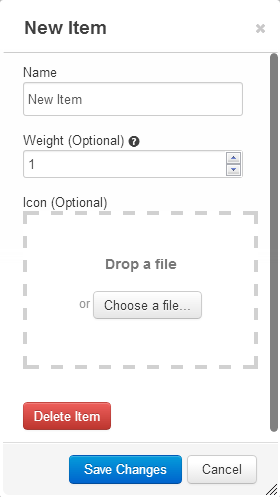 You can additionally add "weight" to items in two methods; either enter the number of times you want the item be a possible result OR enter a percentage value. When using percentage values, do not place "%" after the number, and the final number of all items that are elements of the table must equal 100. From the "Decks & Tables" tab of the Sidebar, you can simply click the "Roll" button to use your table, and the system will randomly select one of your "items" to show as the roll result. After rolling it once, it also shows up as one of your last ten rolls in the Dice Roller. You can also roll a table directly in the chat input, or in a macro, by using the special roll command 1t[table-name]. For example, to roll your "crit-failure" table one time, you would enter /roll 1t[crit-failure]. You can change 1 to whatever number you would like. However, this currently does not work with inline rolls. You can also roll a table inline in chat or a macro by wrapping it in double square brackets like this [[1t[table-name]]]. Currently, any number beyond 1 does not display for the inline roll, the results are show on mouseover though. If at least one of your Items has an icon assigned to it, you can create a Rollable Table Token based on the Rollable Table. A Rollable Table Token looks like any other Token, but with the added feature that you can select which Side of the Token is shown. This is very handy for changing the appearance of shape shifters, different equipped gear, or even changeable terrain. The Rollable Table Token inherits all of the images that have been set as icons on the Items, but will not change if later images are added to the Table. 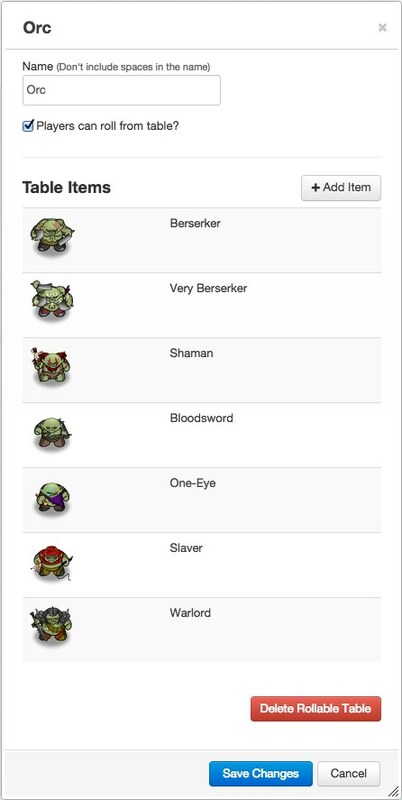 Rollable Table Tokens can be used to represent a character and can be assigned as the default token for a character. To create a Rollable Table Token on the current page, click the Token button next to the Rollable Table you want to base it on. By default, a Rollable Table Token will be marked as Is Drawing. This prevents it from snapping to the grid, and hides its bars, bubbles, etc. 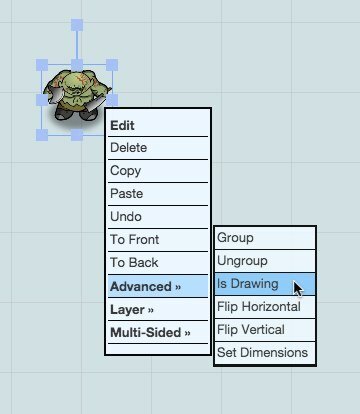 To make it behave like a normal Token, you'll need to right-click it, choose "Advanced", then click "Is Drawing". 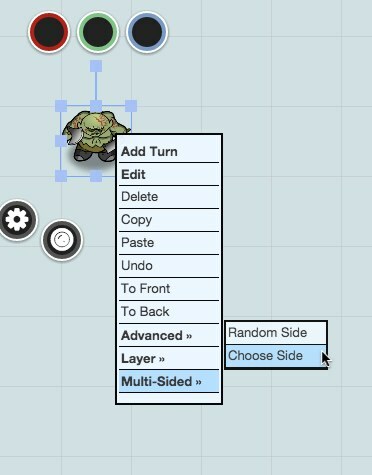 When you want to change the Side displayed by your Rollable Table Token, simply right click it and choose "Multi-Sided" from the menu. To choose a specific Side: Click "Choose Side" to be prompted to choose from the available icons using a slider. To choose a random Side: Click "Random Side" and a side will be chosen for you from the available icons. Note: the weights from the original Rollable Table are NOT used for this selection. Reminder: Changes to the original Rollable Table are NOT reflected in Rollable Table Token after it has been created. If you edit a Rollable Table and want those edits to be shown in your Rollable Table Tokens, you will need to generate a new token. You can use /talktomyself to prevent the Text Chat output of Rollable Table Tokens. Doing so also prevents the context menu from closing after clicking "Random Side". This page was last modified on 11 April 2019, at 01:33. This page has been accessed 221,012 times.